Canada's first prime minister has been scrubbed - at least for now - from government websites in Scotland due to his treatment of indigenous people. References to Glasgow-born Sir John A Macdonald have recently been removed from Scotland.org sites. The change comes amid an ongoing debate in Canada over his legacy and how he should be remembered. In the late 19th Century, Macdonald's government initiated the creation of the residential school system. For over a century, starting in the 1800s, more than 150,000 indigenous children were forcibly removed from their homes and sent to state-funded boarding schools, where children were forbidden to speak their language or practise their own culture. Some students died, many children experienced abuse. 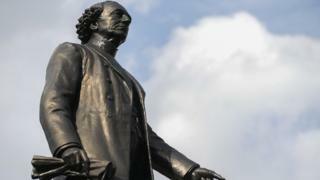 In a statement on Wednesday, the Scottish National Party-led government confirmed it had removed articles on Sir John A Macdonald from the w ebsites "following the legitimate concerns raised by Canadian indigenous communities about his legacy". "While we want to celebrate the very positive contributions Scottish people have made across the world we also want to present a balanced assessment of their role and are reviewing the wording of these articles in that light." References to the Sir John A Great Canadian Kilt Skate, an ice skating event in Canada funded in part by the Scottish government, have also been removed. The government is reconsidering future funding. Sir John A Macdonald has long been celebrated in Canada as a nation builder - the father of Confederation who played a leading role in the effort to achieve a union of Britain's North American colonies. But in recent years there have been growing calls to recognise the darker side of his complex legacy, which includes establishing the residential school system. Its impact has been depicted as "cultural genocide". In his determination to connect the country from coast-to-coast with a transcontinental railway, his government also forced some First Nations from traditional territories, withholding food until they moved to areas designated as reserves. Calls have grown to remove his statues and his name from buildings across the country. Most recently, a statue of Macdonald was removed from the entrance of city hall in Victoria, British Columbia, taken down as a gesture towards reconciliation with indigenous people in Canada. The Canadian Historical Association recently removed his name from one of their prizes. How do you decide when a statue must fall? The debate around monuments recognising the first prime minister and other historic Canadian figures echoes the movement in the US to remove Confederate symbols from the 1861-65 American Civil War. So far, the Canadian government has resisted calls to remove Macdonald's name from federal properties. Last week, federal Environment Minister Catherine McKenna said she has asked bureaucrats overseeing historic sites to look at how to address concerns with monuments like those to Sir John A Macdonald, but she added that "you can't erase history". Michael Cohen admitted violating campaign finance laws, but Mr Tr ump says he has "made up stories". What was song Hotel California about? Who wins and loses from impeachment talk? Who is the woman in the blue dress?